J.R. Dunn Jewelers has a supply of jewelry that is in-demand, and will be on-sale in the showroom for two days: Friday, April 22 to Saturday April 23, 2016. Join the festivities one or both days from 10:00 a.m. to 6:00 p.m.; the timing is perfect for Mother’s Day, Father’s Day and Graduation Day gifts! Items from some of the world’s most popular designers will be discounted as space is cleared for new inventory. What will you find at the event? A great selection, a knowledgeable and friendly team of sales professionals, and double the manufacturer’s warranty offered on all jewelry and accessories. And, of course, champagne and mimosas for your browsing pleasure! Look for sterling silver and karat gold jewelry in white, yellow and rose gold. Wrap your wrist in a gold and diamond evil eye bracelet or Swiss watch with a stainless steel or titanium bracelet, or rubber or exotic skin strap. Adorn your ears with chandeliers, hoops, ear climbers, studs and dangles. Color your world with a gemstone necklace, pendant or ring…and more! You’ll find pieces that have texture, unparalleled craftsmanship and are totally on-trend! Storewide savings are up to 50 percent off; merchandise includes pieces that will come with a 30-day-return policy, as well as those that are final sale and are non-returnable, not-refundable and non-exchangeable. Savings like this come but once a year, so think ahead, and “shop and store” for the rest of your 2016 occasions (food for thought)! Transform your look with authentic designer jewelry from J.R. Dunn Jewelers, an authorized retailer with authentic merchandise. 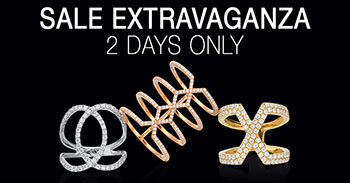 Your next piece of designer jewelry is waiting for you! Call 954-782-5000 for more information about the J.R. Dunn annual Sale Extravaganza.